Freshly installed Exchange 2013 Server (was migrated from Exchange 2007) and it threw out this error. The path to the Queue Quota component log has not been set. Queue Quota component log will not be written. 2. Above we can see three things, Get-TransportServer is a command that is going to be depreciated, there is NOTHING set for the QueueQuotaLogPath, and QueueQuotaLogEnabled is set to true (it’s turned on). Even if we use the newer syntax (below) the result is the same. 3. 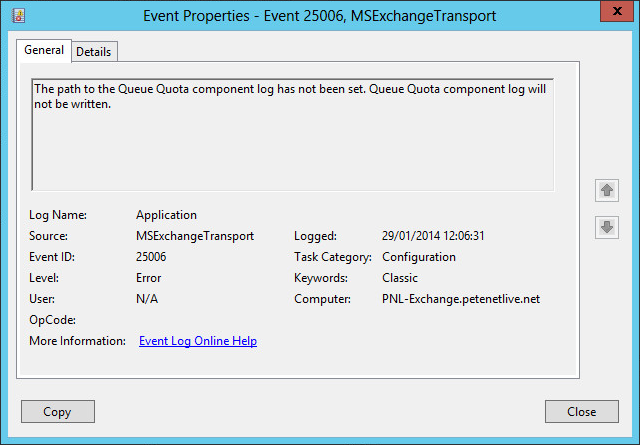 OK, first I created a folder on the Exchange server and tried to manually set the log path. Then I tried to set QueueQuotaLogEnabled to ‘False’ to see if that cured the problem. It would not let me do either. Some more searching led me to find that these properties can not be changed (at the moment anyway), as they are both flagged as ‘This parameter is reserved for internal Microsoft use’. WlmLogPath Optional This parameter is reserved for internal Microsoft use. QueueQuotaLogEnabled Optional This parameter is reserved for internal Microsoft use. QueueQuotaLogMaxAge Optional This parameter is reserved for internal Microsoft use. QueueQuotaLogMaxDirectorySize Optional This parameter is reserved for internal Microsoft use. QueueQuotaLogMaxFileSize Optional This parameter is reserved for internal Microsoft use. QueueQuotaLogPath Optional This parameter is reserved for internal Microsoft use. So, in typical Microsoft fashion, it looks like we will have to put up with this error, until they make those parameters editable. If that changes, send me an email (link below).